I posted quite a while back about Jack losing his first tooth and having a visit from the tooth fairy. I received so many emails from readers asking me about how I made my tooth fairy pillow, that I decided to finally post a DIY. This project is really simple even for beginner sewers and should only take an hour or so to make. I cut a piece of vellum 6 inches square to use for my pattern, then simply cut out a front and back for the pillow. You don't have to use vellum - you could use any paper you have lying around. On one piece of fabric pin your piping (make sure to pin it to the "right" side of your fabric). Use your zipper foot attachment on your machine to stitch down the piping. Take a coordinating fabric and cut a piece about 8" long and 6" wide. Fold it in half and press it down. Place your fabric strip (the one with the button hole) diagonal across the front of your pillow. Now take your other fabric piece (the one you stitched the piping on earlier) and pin it on top. Right sides facing each other. Then stitch, making sure to leave a small opening so your can turn the pillow right side out. Trim the corners with your scissors, then turn the pillowcase right side out and press flat. After pressing it flat, simply sew on your button and stuff with polyfill. You'll need to hand stitch the opening closed. The last step is to wiggle those teeth so the Tooth Fairy can visit. Jack was so excited about his, he could hardly sleep! omgosh, what a wonderful idea!! i'll have to past this on to my friend who loves diys:) thank u for sharing! 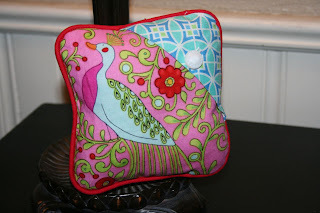 We're still waiting to lose another tooth over here to get to use this so-stinkin'-cute pillow you made! Plus, it will make the tooth fairy's job of find said tooth so much easier! Cute! Jack's sheet's are awesome, btw. You make everything look so easy...and SO GOOD when it's finished! oh this is the sweetest idea. it looks great! This is a great DIY! I'm thinking it could also be modified to be used as a ring-bearer pillow in a wedding. Thank you so much for the design and great instructions. My youngest daughter just lost her first tooth. I knew it was coming so I made the pillow. It worked great! This is a lovely blog! The pillow is really creative !